The Cheyenne High School drama department competed in the class 4A Regional one-act contest on Saturday, October 7, 2017. 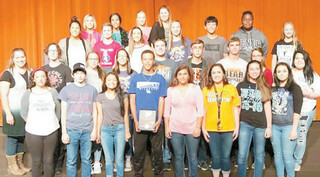 They competed against five other schools and placed third, which secured them an opportunity to compete for the state championship title in Mustang on October 26, 2017. Juniors, Taylor Choate and Halie Sanderford were honored by receiving Regional All Cast. Junior, Ashley Tracy received All Cast runner up.